The regular control of the chemical composition of products is one of the fundamental pillars of the quality assurance system of any glass production process. 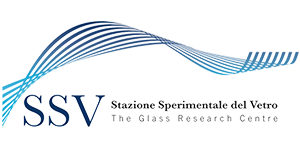 With its state-of-the-art analytical equipment, Stazione Sperimentale del Vetro is capable of determining with reliability and timeliness both the concentration of the main oxide components of glass articles, and of their trace contaminants. SSV can also offer customized analytical services to glassmaking companies, tailored to their specific needs. The X-ray fluorescence technique allows the fast determination of the abundance in the sample of the most common elements present in glass (e.g. Si, Al, Na, K, Ca, Mg, Fe, etc), expressed as weight percentages of oxides; the limit of quantification of the instrument varies between 0.001% and 0.01%, depending on the specific element. The analysis on glass articles is usually carried out by cutting a standard diameter disc from a finished article, or from glass gobs taken under the spout with special moulds, cooled off-line (usally by pressing onto a cold plate) and then annealed. If none of the above alternatives is feasible, the sample can be obtained by softening on a platinum mould an appropriate quantity of glass fragments by means of a flame. When the quantification of impurities or contaminants present as traces (e.g. Pb, Cd, As, etc.) is required, the determination is carried out by “wet chemistry” techniques, using instruments such as GF-AAS, ICP-OES or ICP-MS, according to the specific element to be analysed and to the limit of detection or quantification to be achieved.